The entrance to the residential tower will be from Greenwich Street while the entrance to the church-related space will be located on Trinity Place. Access to the church will be maintained via the existing pedestrian bridge across Trinity Place. The new structure will contain a parish hall, facilities and offices for Trinity’s expanding ministry, the Sunday school and rooms for use by community organizations (more than 60 groups currently use 68-74 Trinity Place). Trinity will continue to operate its preschool, presently housed at 68-74 Trinity Place, at a new neighborhood location. It is anticipated that construction of the new structure of 296,000 square feet will begin in the fall of 2014, with completion slated in 2017. Interim relocation plans are being developed to relocate all existing ministry activities and related staff offices housed in 68-74 Trinity Place to a location in close proximity to the church. These pr.icks are tearing down that beautiful building? What greedy asses. I can't remember being this angered and upset over an impending demolition. Is there anyone I can write to, at least to express my outrage? LPC? anyone have a picture of what is getting demolished? I suspect that appendage behind the building is part of it too. This demo will surely remove it and the additional height will come from a tower on a podium rather than the tshape it is now. This is a very attractive building, and reasonably tall already. It is somewhat curious why it's not just being redone like 20 Pine. They may be something we're missing. Or not. I heard that they were also considering doing a renovation on the current building. Maybe they were just blowing smoke up everyone's asses. It'll be a damn shame when they demolish the current building. If it got a cleaning it'd look amazing. I suspect the church sees $$$. These greedy jerks own half of Manhattan. They should build on an empty lot in Hudson Sq. Was the existing building ever presented to Landmarks as a candidate for individual designation? Landmarks would have denied it even if it were. I haven't commented on here too much, but I must say that if this building is allowed to be demolished, it would be one of the most significant architectural losses the city has seen in decades. This must be stopped! These greedy bastards obviously forgot what "The Big J-ster" said about money: "Render unto Caesar what is Caesar's...."
Historic downtown church flexes its real estate muscles with new Pelli Clarke Pelli tower. Nestled amid the towers of the world’s biggest banks and finance companies, Trinity Wall Street, a relatively diminutive neo-Gothic structure designed by Richard Upjohn in 1846, might seem quaint. But with assets estimated at more than $2 billion (thanks, in large part, to a colonial land donation in 1705), Trinity is right at home with its wealthy neighbors. Though its bank account would be the envy of many parishes, it is generating internal strife since the church must now decide how to best deal with its considerable real estate holdings. At the moment, the source of this tension is the building code of its 90-year-old administrative office at 68-74 Trinity Place. Faced with a $33 million price tag for building-related work aimed at meeting 2018 code compliance, the church’s vestry, or overseeing board, is considering razing the existing structure and building a new, fully-compliant one for an estimated $35 million. As a way to explore this option, it engaged two design firms—COOKFOX Architects and Pelli Clarke Pelli Architects—to carry out conceptual designs. The church asked other teams to submit designs, but it was COOKFOX and Pelli Clarke Pelli that answered the call. “Our criteria for inviting these architects was that they would be committed to great design, that they had done a number of buildings in New York, and that they would be excited and challenged by the commission,” said Linda Hanick, Trinity’s vice-president of communications and marketing. 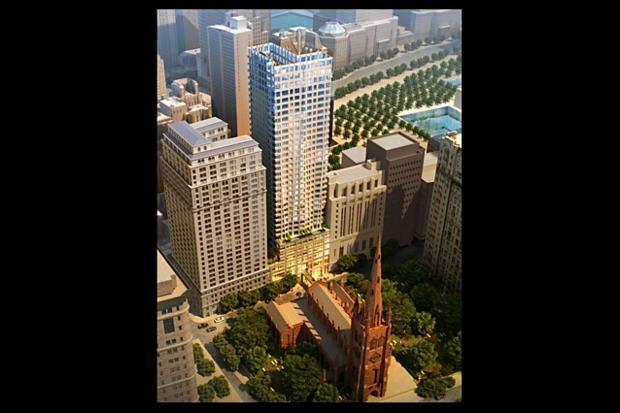 Both schemes included six or seven stories of administrative offices topped by a 25-story residential tower that will pay for the project and help keep the church coffers full. Prior to the announcement, the firms were barred from speaking about the project, but the church released renderings of each design and a video of comments by the architects. Pelli Clarke Pelli’s glass-and-steel tower is meant to minimize its impact on the historic site. COOKFOX proposed a stone-and-glass structure with heavily planted outdoor space. The CookFox proposal is far more elegant. The Trinity Church elders and others in charge there continue to expose themselves as the worst sort of citizens.